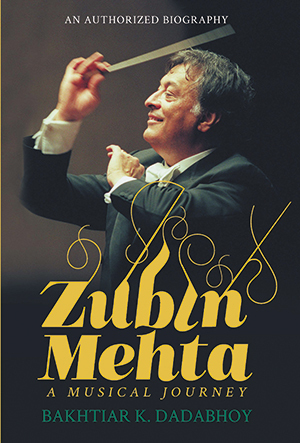 Zubin Mehta feels that the only real way to learn music is through a live performance. He says that one can learn theoretically and by listening to records but the best way to grasp music is a live performance. He is also emphatic about taking scores along to all rehearsals. He says that he was able to learn a lot because he always took the scores with him. He finds it strange to see young students without scores in his practice sessions since one must read together to be able to understand everything in detail, including the mistakes that are inevitable. In his student days in Vienna, Zubin attended as many concerts as possible. Since standing room tickets cost only twenty cents, Zubin, with his modest allowance, was able to afford them. Sometimes, unable to choose, he would buy tickets for more than one performance, and he and his friends would rush from one concert to the other during the interval to witness the second half of another performance at a different hall. His experience was one of complete immersion in the musical life of the city, studying during the day and attending concerts and performances every other night. Vienna in the mid-1950s was an ideal place because artistes didn’t travel much in those days. The Vienna Opera had an ensemble made up of legendary singers who were ‘just living and singing every night’. Zubin shares a particular musical experience from his first time in Vienna that is still fresh in his memory. One day, as he was walking past the Musikverein, on a whim (and driven by curiosity) he slipped in through the back door. He heard Tchaikovsky’s Fourth Symphony being played. He was familiar with the piece, having heard a recording played by the Boston Symphony Orchestra under Koussevitzky. But as with Brahms’s First, he thought that he was hearing something totally new. Running along the corridor he peeped through a keyhole and saw Karajan conducting. He had never seen him in real life but recognised him from his photos. Zubin’s first concert, however, was when he sang under Karajan who was conducting Beethoven’s Ninth Symphony. Zubin made his first recording not as a conductor, or even an instrumentalist, but as a singer. In the summer of 1955, Karajan, who was the director of the Vienna Symphony, the city’s second orchestra, was making his first recordings of the complete Beethoven Symphonies with London’s Philharmonia Orchestra. He brought the entire orchestra to Vienna to use the Singverein as his chorus for the Ninth Symphony. Zubin was paid fifty schillings for the recording and remembers treating himself to a hearty meal with the money. ‘So I went to a good restaurant and treated myself to a real veal schnitzel, not the cheap kind made of pork.’ Zubin also recalls that he got a panic attack when Karajan insisted that all the members of the chorus should sing from memory. Even though Zubin was by now a little more familiar with German, Schiller’s Ode to Joy seemed to him more than he could handle and he spent half the night memorising the piece. ‘It worked out somehow. In any case, I don’t remember embarrassing my choir members,’ he recalls. Zubin was always running off to rehearsals, missing classes at the academy. Sometimes when there was a class on the history of music or on the theory of musical forms, it was quite likely that he would instead be listening to a Brahms symphony being rehearsed elsewhere. He is never tired of reiterating that while theoretical analysis is important, nothing can replace the education gained through live performances. Kubelík, Böhm, Mitropoulos, Josef Krips and Hans Knappertsbusch all came to Vienna and Zubin attended as many of their concerts as he could. Just watching these great conductors showed him how much he still had to learn. Zubin also discovered the music of Mozart in Vienna. The music he had listened to in Bombay had been dictated by Mehli’s (Zubin’s father) preferences and Mozart does not seem to have been a favourite. He also became acquainted with the music of Bach which, according to him, was largely ignored in Vienna. Though he studied the St Matthew Passion and the Magnificat, he always considered the music of Bach to be a gap in his musical education. He does conduct Bach occasionally but prefers ‘to leave this job to my other colleagues’.